This refers to your annual Luxury Issue 2017 (September 24). Your editorial rightly mentions the limitations in getting details on the exact number of high net worth individuals in India. Yes, in India demonetisation did play a part in curbing the desires of the super rich, but it is a momentary phase. Making money and acquiring assets like luxury villas, cars, exotic jewellery, is the physical side of a human being's basic desire to show off. Enjoying moments of pleasure by dining with your family and friends on occasions like birthdays and anniversaries in exclusive restaurants or hotels is the emotional side for keeping the memory of those intimate moments alive for life. Business Today's issues on luxury motivate the readers like us to at least dream of owning and enjoying the feelings of having luxury watches, swanky yachts, designer jewellery, opulent bathrooms, exclusive gourmet foods, luxurious houses, lavish weddings, and what not! Kudos to the entire BT team for a job well done. 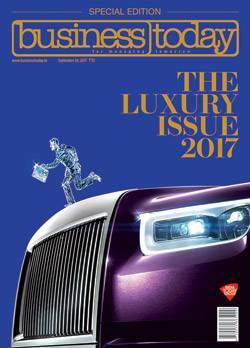 This refers to your annual Luxury Issue 2017. Business Today deserves encomiums for impressive graphics and easy text. The details on gorgeous dresses, sumptuous foods, rejuvenating sojourns, mellifluous music, and so on of the rich point to the waves of pleasure principles. It is praiseworthy that Indians do not flaunt their wealth and reflect their glow of growth in monetary channels. Nothing is wrong in building assets or turning wealthy, but poverty of the downtrodden and struggles of the middle-class of Indian masses must sear the conscience of the rich. They must voluntarily become tax-compliant and share governmental responsibilities. This refers to your article on commercial airlines (Taking a Dive, September 4). Definitely, the effects of demonetisation followed by GST implementation have put a break on the growth of domestic passenger traffic. But the prime reason for the fall in traffic is the hike in tariffs by major carriers. There may be many internal problems like high-cost aviation turbine fuel and frequent flash sales, the major airlines have to spend a sizeable fortune if they want to stay profitable. This refers to your article on the ongoing battle on franchise agreement between McDonald's and Vikram Bakshi-controlled CPRL (Tortuous Times, September 24). In fact, Bakshi's move was to keep around his 170 CPRL outlets functional beyond the deadline. But the recent ruling by the London Court of International Arbitra- tion, in favour of McDonald's, could put a check on it. This refers to your article on start-up Arcatron Mobility (Wheeling in a New Life, September 10). No doubt this wonderful device - a NIT (Calicut) product - would help make life easier for millions of physically challenged and senior citizens. Thanks to BT for bringing out such features.